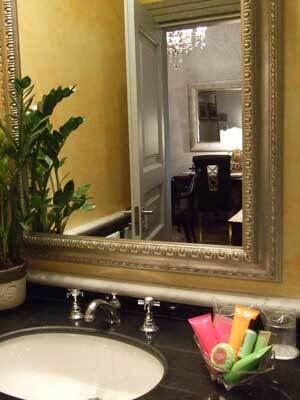 The Inn at the Roman Forum is a luxurious boutique hotel close to the Colosseum and Roman Forum in the heart of Rome. It is a 'hip' hotel and a special place to stay (one of the Small Luxury Hotels of the World) with some really gorgeous rooms, a secret rooftop garden and its own ruins. Although it isn't cheap, it does sometimes offer quite reasonable rates online, and it has a range of room-types at different prices. I stayed at the hotel for one night in March 2009. Using this website's online reservation link, I found a classic double room online at quite short notice for the price of €187. It would have been possible to book on a special-deal room-only basis for €165 but I chose to pay the extra for breakfast. As soon as I'd booked I received official confirmation through the booking network and also an email directly from the hotel, welcoming me and offering advice and assistance if required. The hotel's entrance was even more low-key than I expected, with just a small brass plaque next to the doorway (see photo below left). I made my way through a corridor ornamented with archaeological fragments to the little reception office within the building. This wasn't spacious or like a traditional hotel foyer, but the receptionist was welcoming, inviting me to sit or to inspect the hotel's ruins while she registered my passport. I was brought a welcome drink and my suitcase was whisked to my room. 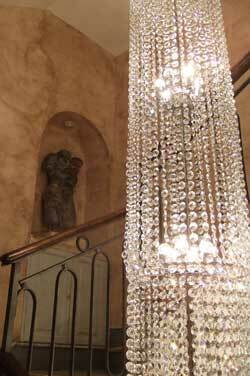 The hotel is basically a five-storey terraced townhouse around one staircase - which is beautifully presented with a long suspended sparkling chandelier and sculptures in alcoves. There are just a few rooms off each landing. A little modern lift also connects the floors. On the fourth floor is a lounge and a small terrace. Space is obviously restricted in this kind of historic building and it would be hard for the establishment to set itself up as a traditional hotel. 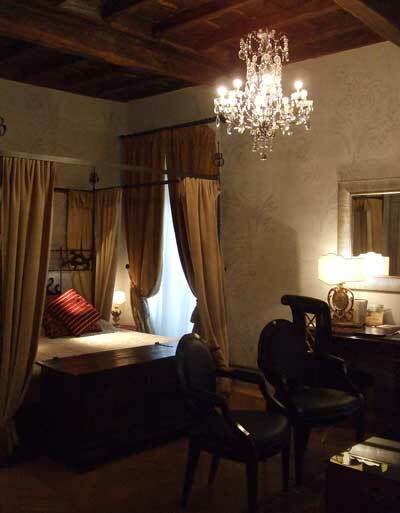 Instead it is a good example of an alternative to a traditional hotel: an intimate, boutique place to stay. According to the legal classification pinned in my room, the Inn is technically an affitacamere ('room-rental', like a guesthouse) and the official top price for my room was just shy of 2000 euros. I later found that I had been given an 'executive room' - a very good deal for the price I paid. My room was beautiful. Entering from the door along a short corridor, I wasn't prepared for the size and stylishness of the space beyond. 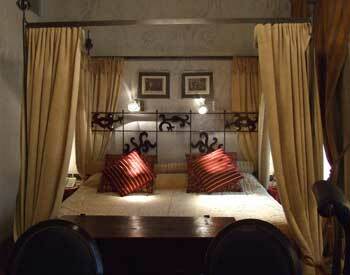 It had the widest bed I've ever seen: a four poster combining contemporary and traditional touches. Later inspection found the bed to be composed of a double and a single mattress pushed together and made up as a three-pillow-wide divan. The floor and ceiling were both wooden, the floor warmed with an old-fashioned rug. The door to my room opened from the stairs onto a little corridor, next to a wardrobe containing a safe, (my laptop just fitted in, many wouldn't). This corridor led into the main part of the room, which had the huge bed at one end and a sitting area at the other, where a vast flat-screen television (various international channels including BBC News) was mounted above a imposing stone fireplace. The furniture was attractive, and chosen with eclectic taste. There were little bedside tables, a big chest at the foot of the bed, a coffee table which doubled as an unusual chest of drawers, an attractive wooden desk with a chair and convenient electricity sockets, two other chairs, a richly-upholstered sofa, a mini bar, standard lamp, a large mirror and a couple of prints over the bed. The room was equipped with air conditioning, a radiator and also an Ipod dock with speakers and a wall-mounted weather station (which seemed quite accurate). The bathroom was very nice, though not large. It had a jacuzzi bath with a good shower overhead, a stool, marble surfaces, a plant and plenty of room for guests' washkits. There were thin Italian-style hand-towels, but the bath towels were traditional and fluffy. A proper hairdrier and a curling iron were stored in the wardrobe. There was a good selection of quality toiletries, and other useful extras included pens, notepads, slippers and bathrobes. My room was at the front of the building, looking out over the narrow lane. From my two French windows I had a view of the ornate but wonky stone window frames opposite, a drinking-fountain gurgling outside, flowers in the window boxes and creepers on the wall. I liked the decor. Some aspects worked better than others, but the room - like the rest of the hotel - was stylish without being too trendy nor too kitsch. The original features - beamed wooden ceiling, French windows, stone fireplace - worked nicely with the furnishings which had just a tiny pleasing touch of eccentricity. It wasn't totally perfect - there were a few scuffs on the wall - but I thought the standard of accommodation was very high, and that the room was furnished, like the hotel, with warmth, generosity and taste. The only trouble was that it was such a homelike and richly 'cluttered' environment that I found myself negotiating free-standing furniture and mislaying things like slippers in a way that wouldn't happen in a standard box-like hotel room. The lounge on the fourth floor was lovely and welcoming in the early evening: a stylishly-decorated, warm and welcoming space with books (art, films) scattered on coffee tables, comfortable sofas and a real fire crackling in the fireplace. A free buffet was laid out with light snacks: cheese, meat, savouries and fruit. Although drinks were available in the hotel, there wasn't a real bar and prices were quite high. Breakfast was taken in the lounge, with place-settings on low coffee tables. It wasn't the most comfortable set-up but the ambience was nice. In milder weather one could eat at tables on the little terrace outdoors. The buffet breakfast was spread over two sideboards and was a good breakfast by Italian standards. Hot drinks were brought by the attendant waiter, including a choice of teas with a rather impractical teapot. The self-service buffet included rolls, two cereals, yoghurts, cold Spanish omelette, cheese, meat, fresh fruit, Caprese salad, muffins, some very tasty filled croissants and warm eggs and bacon. The small terrace outside the lounge was appealing, though a March evening wasn't warm enough to sit outside. Although other rooftops obscured part of the view, over the top I could admire a section of the Palatine hill and various churches. At the back of the building, still on the fourth floor, was a surprising hidden garden with a lawn and trees. The most unusual sight in the hotel, though, was probably the little complex of ruins. The hotel is at the back of the Fori Imperiali (Imperial Forums) and close to Trajan's Market, an ancient Roman shopping mall. As the area has been built up ever since, the old layers of history are incorporated into more recent buildings; the hotel has opened up a few arched chambers, complete with scraps of carved stone, which were part of the Roman city. There's not really a great deal to see but it's an unusual and very atmospheric sight. Since the hotel was so small, and wasn't full during my visit, I only saw about four other guests during my stay. The building was very quiet, considering it is in the heart of Rome - the loudest sound I heard in the morning was a bird cooing. The staff I encountered during my stay were friendly and helpful. The free wireless internet and the free evening buffet were thoughtful extras. 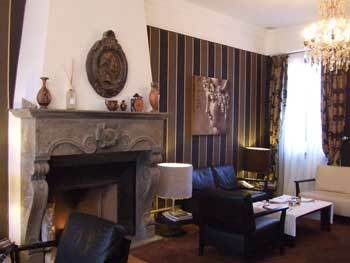 I really liked the location and the 'exclusive' feel to the establishment, and I loved my luxurious room. Service was good, the lounge, garden and terraces felt like special secret places, and the hotel rather spoiled my appreciation of the totally decent but standard hotel I visited on the following night. 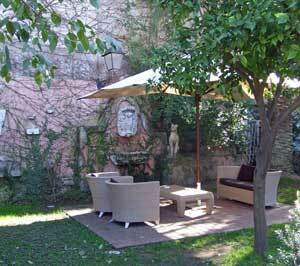 This hotel is lovely for couples who want a special, private base to return to in the heart of Rome. If you appreciate the picturesque little lanes and having a luxurious 'home' during your stay, the Inn at the Roman Forum would be ideal for a special break or a honeymoon. I was lucky in being upgraded to a room grander than the one I'd paid for. If you can bear the price, I'd recommend paying for one of the more expensive rooms in order to really make the most of your stay. Hotel address: Via degli Ibernesi, 30. This is on the slopes of one of the seven hills of Rome, behind the Imperial Forums (Fori Imperiali). It's at the edge of the picturesque medieval Monti district. I walked to the hotel from Stazione Termini as I knew the route was almost entirely downhill. However, it did take 25 minutes, with the last stretch involving cobblestones, so I'd recommend a taxi or getting a bus or Metro. This isn't really a terribly good hotel for those with mobility problems - the lanes here are sloping or stepped and paved with Roman cobblestones. The best transport connections are the Metro with stops (Linea B) at Cavour and Colosseo, and bus stops on Via dei Fori Imperiali. Note that some guests have complained about the location (perhaps not appreciating Rome's poky medieval charm, perhaps finding slopes and cobbles rather difficult). 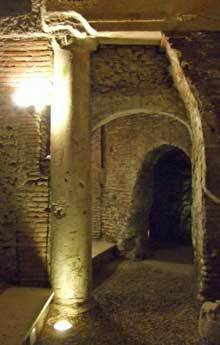 Other guests, including myself, have loved the proximity to Rome's archaeological sights, the characteristic charm of the area and the hidden-away feeling. 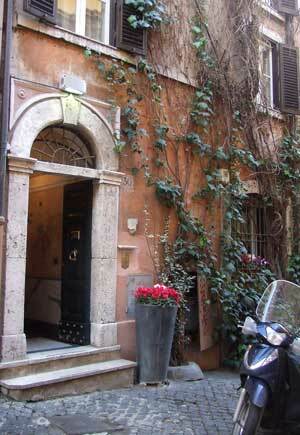 Inn at the Roman Forum review by Italy Heaven editor.